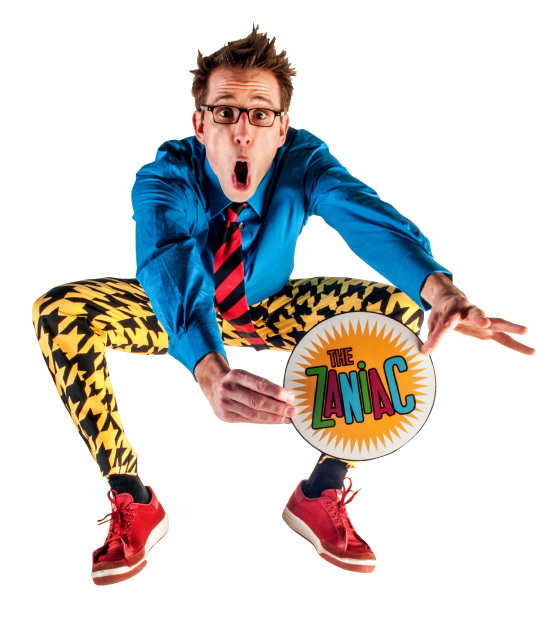 Alex Zerbe, aka The Professional Zaniac, moves like a rubber band from one end of the stage to the other, captivating the audience with his boundless energy. 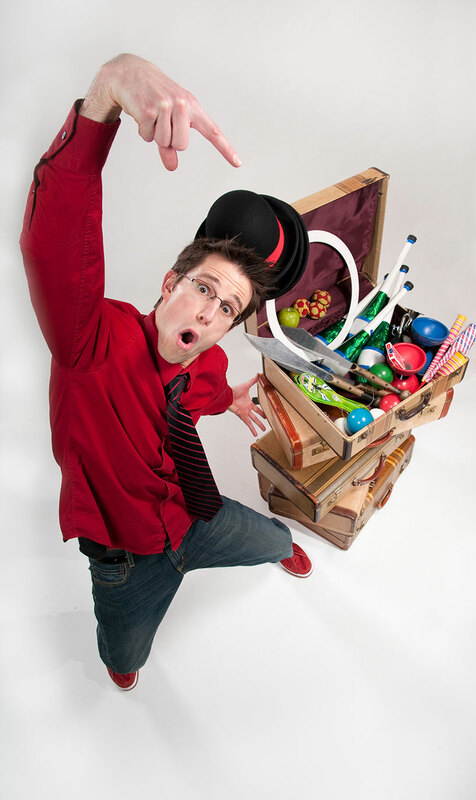 Experience a comedic onslaught of absurd ideas and odd skills as he gets students laughing and learning with his hilarious props and onstage antics. A two-time Guiness World Record holder, Alex has appeared on ‘America’s Got Talent’, ‘Last Comic Standing’ and was voted the Pacific Northwest’s Funniest Prop Comic! Voted the Pacific Northwest’s Funniest Prop Comic – students will be thoroughly entertained and engaged. Great student involvement including on-stage volunteers and crowd participation. Strong message for students – choose a Science themed show or one that focuses on Literacy and Creativity (and include an Anti-Bullying component if you wish). Study guides to deepen your students’ understanding of the material can be sent in advance, upon request. 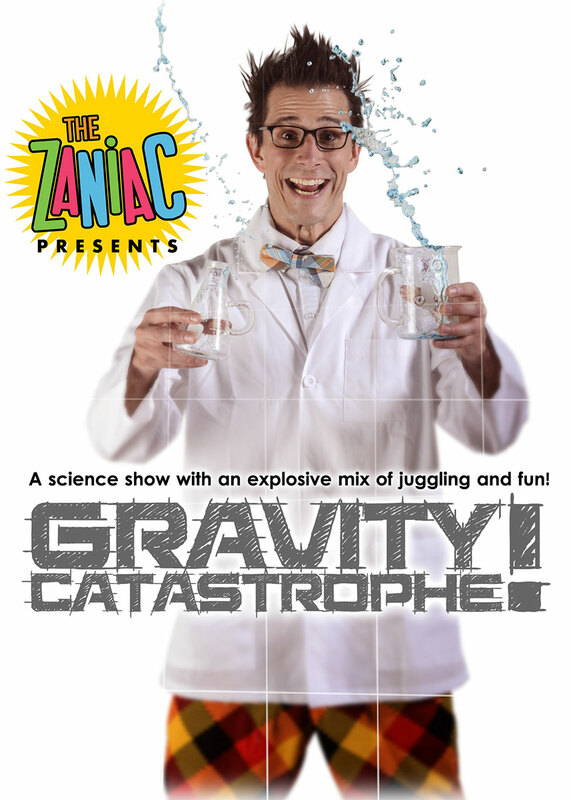 A Science Show with an Explosive Mix of Juggling & Fun! 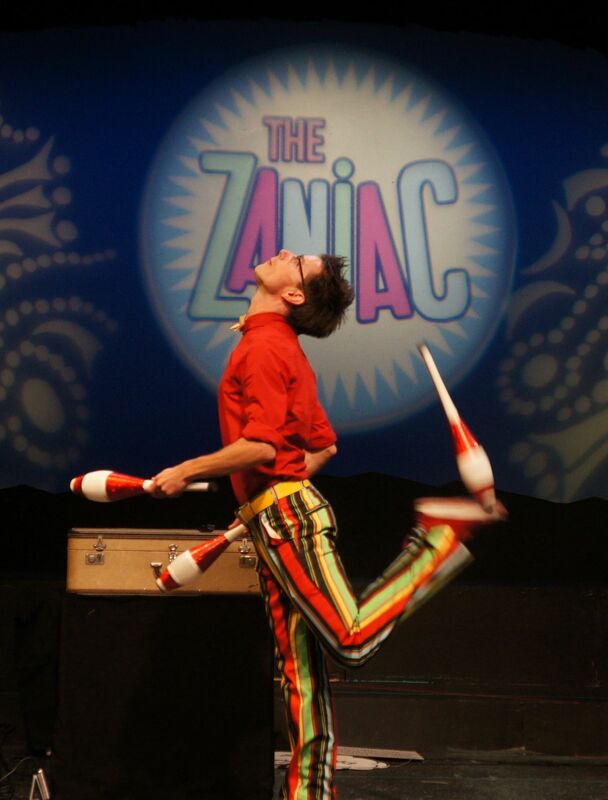 The Zaniac takes a tornado of juggling skills, combines it with a whirlwind of in-depth physics knowledge, and sends it crashing directly into each student’s brain. 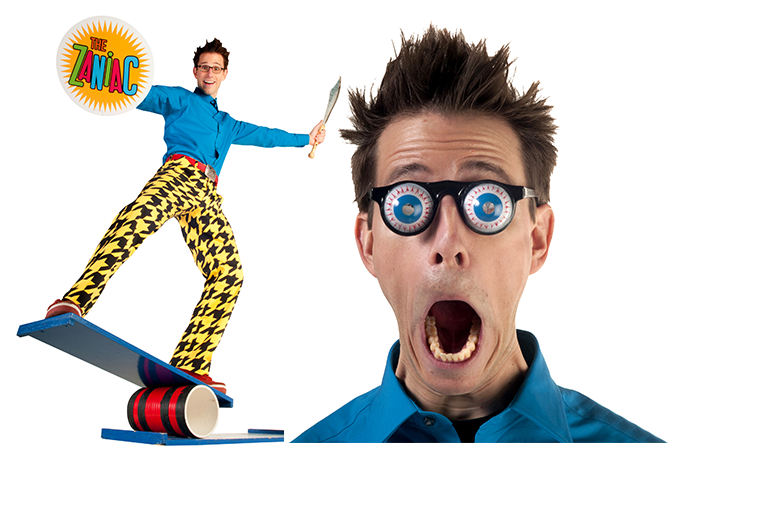 Your students will learn about acceleration, simple machines, the scientific method, centripetal force, the solar system, angular momentum, and Alex will even catch a shovel with his face to demonstrate center of mass. Inspiring Creativity through Phys Ed, Arts, and Literacy! 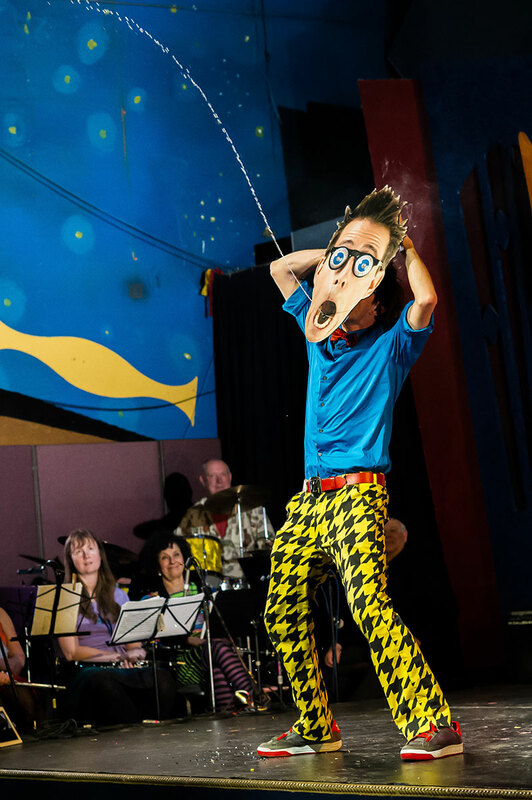 Come Alive is an educational and entertaining assembly that excites kids about the joys of reading and teaches the importance of confidence, persistence, and creativity. An onslaught of visual and verbal comedy that entices audience volunteers out of their shell and encourages self-expression. An anti-bullying message can easily be incorporated into this presentation. For older grades, the message is tailored to their age with an emphasis on creativity, confidence and persistence as opposed to reading and literacy. It was amazing how well you incorporated all the educational messages into the show. You were a huge inspiration to the students! The sixth graders wanted autographs! It is really hard to get them excited and it was delightful to see them so happy. When you did your “At the Library Rap,” my son was like,”I’m gonna go home and do that! You kept the kids focused, entertained, and inspired. I would be happy to recommend you to any and everyone. OMG!! Your performance was EXCELLENT I really liked it!!! Alex was phenomenal. Not only were the kids having the best time ever but the teachers were rolling on the floor laughing. We loved the library and reading connection. Many students and staff have approached me and offered their thanks for coordinating the assembly. I would highly recommend you to any other school. WOW! Alex was amazing! He performed for our graduating seniors on their all-night graduation celebration, which means he performed, full of energy and wit, at 3 AM. He had read our local paper and made jokes with the kids as if he’d known them for years. They loved it! I would HIGHLY recommend Alex. He is professional, extremely talented and accommodating! I would hire him again in a heartbeat!